The Cure for the Metallic Blues » Embroidery Talk Has Moved! I’ve seen it happen over and over again at trade shows. I’ll be giving people a sample of thread, or a sample of backing and they’re excited and pleased to receive whatever I offer. When, however, I offer a sample of our metallic thread, some people recoil like I’m offering them a boiled spider on a plate. “I hate metallic thread” is a common comment, or “Metallic thread is such a pain”. Apparently, metallic thread is an issue for a lot of embroiderers. I’m guessing most people have heard the horror stories that tend to accompany metallic thread. Some people tell of the constant thread breaks. Others will recount how they had to run their machine at glacial speed to enable the thread to sew. There are tales of tangles and knots and other horrors. In the end, each story concludes the same way, with an emphatic “I hate metallic thread”. My response to those sort of statements and stories is “You won’t hate our metallic thread” and, as it happens, I generally turn out to be right. Iris Dazzling Metallic thread is designed to run smoothly. While you do have to slow your machine down slightly, it doesn’t require that you machine run at snail like speeds in order for the thread to perform well. EnMart’s parent company, Ensign Emblem, runs this thread in all our plants, so we know it runs more smoothly, with less thread breaks and fraying. We also know it adds a superior sparkle and shine to all your metallic embroidery. 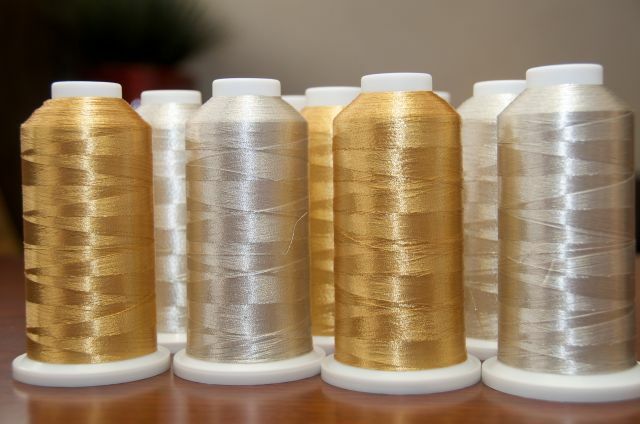 Metallic embroidery thread is a great way to accent a design you particularly want to stand out, and, with the recent addition of our colored metallic embroidery thread, you have even more options when it comes to adding color and sparkle to your designs. If you’ve one of the embroiderers who was sworn off metallic thread, take Iris Dazzling Metallic thread for a test run and find the cure for the metallic blues. This entry was posted on Monday, August 30th, 2010 at 10:38 am and is filed under Thread. You can follow any responses to this entry through the RSS 2.0 feed. Both comments and pings are currently closed.